These Wooden Easels with Ornate Assemblies are Elegant Floor Stands! 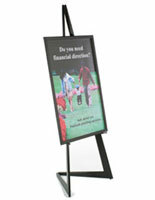 Develop Your Own Presentation in Just Minutes with a Holder Like These Units! 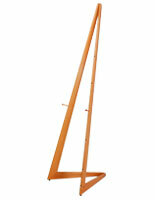 Buy Wooden Easels at Discount Prices Right Here! Constructed from oak, these wooden easels are finished with a black paint for a neutral display that will blend with most any setting. These folding floor stands require some minor assembly. 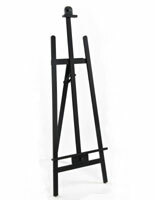 One person can easily assemble these wooden easels with no additional tools required. 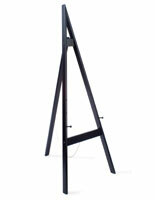 Art galleries and studios often use these folding fixtures to showcase new artwork or a local painter's collection. 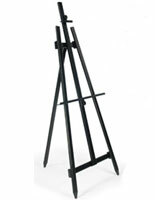 Buy these wooden easels for a restaurant or hotel to display a menu special or upcoming live entertainment. Full dimensions are 64" tall x 21-1/2" deep; the width is adjustable from 5" up to 24". 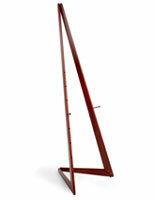 Find many other wooden easels within this e-catalog!